Dr Soledad Garcia Ferrari is a Senior Lecturer at ESALA University of Edinburgh. Professionally qualified in Architecture and Urbanism in Uruguay, her research focuses on current processes of urban development and regeneration in Latin America and Europe. She was awarded her PhD in Urban Studies in 2007 at the School of the Built Environment Heriot-Watt University. 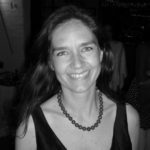 Soledad has extensive expertise on research in recent planning strategies in Medellin and is currently leading Medellin Urban Innovation project awarded by British Council. She taught in the Faculty of Architecture in Montevideo, the University of Seville and was invited speaker to the School of Architecture, CEU in Madrid. She is currently University of Edinburgh Dean Latin America and Director of Edinburgh University Centre for Contemporary Latin American Studies. PhD Marta Kania, representative of the Jagiellonian University in Cracow, Poland.Graduate of archaeology and cultural studies at the Jagiellonian University. Ph.D. thesis defended at the Faculty of History of the Jagiellonian University. Since 2008 employed as assistant professor in the Department of Latin America in the Institute of American Studies and Polish Diaspora at the Jagiellonian University in Kraków. Visiting Fellow and Visiting Lecturer at the Instituto de Estudios Peruanos (Peru); Pontificia Universidad Católica del Perú (Peru); Universidad Nacional San Antonio Abad del Cusco (Peru); Centro de Investigaciones sobre América Latina y el Caribe, Universidad Nacional Autónoma de México (Mexico), Academia de Humanismo Cristiano (Chile), Universidad Nacional San Andres (Bolivia), Universidad Santiago de Compostela (Spain). Her academic interests and research topics are ethno-politics and history of Latin America; nationalism and national identity in Hispanoamerica; political, legal and social aspects of protection, safeguarding and promotion of culture heritage; religious diversity and religious syncretism process in Hispanoamerica. Author of books and articles about relations between cultural heritage and political practice in Latin America (particularly in Peru and Mexico); political and social status of indigenous peoples, and religious diversity in Latin America. Participant of international conferences and symposiums related to Latin America history, culture politics, heritage studies, religious diversity and human rights. One of the main purposes of the LA WG is to increase the relevance of the CG in the EU-LAC cooperation, analyzing the new trends and informing the CG universities about the new opportunities. Being conscious of the specificities of LA Higher Education institutions, the LA WG is convinced that the way to proceed is to reinforce its cooperation with relevant networks in LA. Currently, CG is a partner of and develops activities with the Coimbra Group of Brazilian Universities (CGBU), Association of Universities of the Montevideo Group (AUGM) and Union of Latin America and Caribe Universities (UDUAL), thus covering the South American Continent. BEaDOC | Brazil-Europe Doctoral and Research Programme. CG – UDUAL joint meeting in Mexico City, March 2018. The aim of this summer school is to review, discuss and propose means to achieve more inclusive, equal, sustainable and safe cities. Participants: Academics from AUGM and the Coimbra Group. Open to postgraduate students on both taught and research-led programmes. Coimbra Group – Grupo Montevideo Joint Workshop of Junior Researchers. Mapping the research projects in CG and UDUAL universities in the areas of Prevention of Natural Disasters, Management of Natural Resources, Migration, Gender and Violence and Local Development. Thematic seminar with Félix García Lausín from SEGIB in Salamanca, May 30.